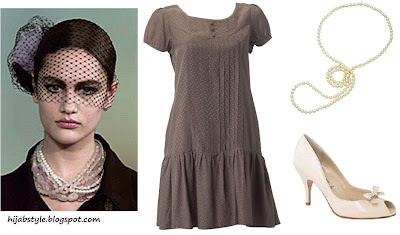 Alternatively, try a little 1920s glamour - it's just right for a ladies-only party! Accessorise with peep-toe shoes and a long string of pearls, and finish off with a delicate netted veil. So chic! You can still do this look with hijab. Just add a black long sleeve top, black trousers and matching shayla. 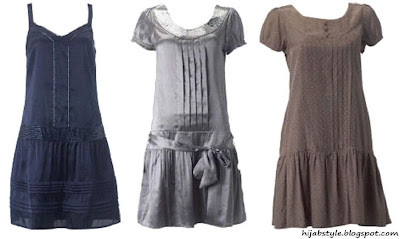 These are some cute dresses! Thanks for recommending them! Salam Sis...niccccce blog! If you tell me the blog button you like from Islamic Blog Directory, I will paste the code here for you...all you have to do is copy it and put it in your sidebar. Hope you join us! Here you go Sis! Let me know whne it's up and I will add you. Thanks for joing us...glad to have you with us! mashallah i love these type of dresses i was gonna buy some, but was not sure if they were ok. but i will now as i have nice pretty long sleeved t-shirts that will cover my arms. i just wanted to ask ur opinion.. what would u wear with this dress to make it more modest? I have absolutely no sense of style so i would appreciate some suggestions. Marium, more modest in terms of hijab, or in terms of a non-hijab environment? If you want to wear it with hijab, I already suggested a long sleeve black top, and black trouers. Or for non-hijab, just wear a pair of black 3/4 length leggings underneath! Anon, thanks! I've already got them in my link list under 'eBay Finds'. Yes they're a bit pricy, but the quality is great.